Looking to try something new for breakfast I decided to give Akershus Royal Banquet a try. I also thought it would be a great way to meet the Disney Princesses to get photos and an easy way to get autographs to go along with the photos for my scrapbook. 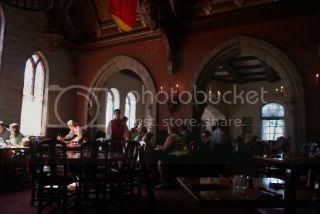 The Akershus Royal Banquet is located in the Norway Pavilion at Epcot and serves a family style character breakfast. Since we were already in the park we decided to arrive at the restaurant a little early for our 10:50 am reservation. We waited until about 11:05 am before we were called to get our picture taken before breakfast with Belle in her formal gown. 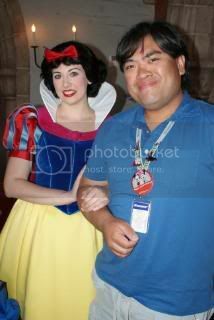 I have to admit that I was thrilled to find out that it was Belle that I’d be getting my picture with. Of all of the Disney Princesses, she’s by far my favorite. Who doesn’t love a smart girl? After meeting Belle and getting our picture taken we waited about another 5 minutes before our table was ready. We were seated and immediately greeted by our server, Camilla with a very warm smile. Just like every other Norwegian I’ve meet in the Norway Pavilion she was delightful, friendly and very helpful. She took our drink order of coffee and orange juice and explained to us how the family style/breakfast buffet worked. 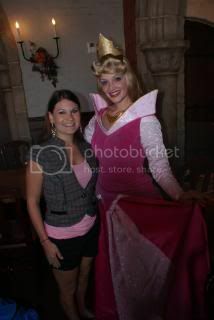 Before we had a chance to get up to grab something from the buffet, Princess Aurora was already at our table. She, just like all of the other princesses was delightful and great at interacting with us. She took her time and didn’t rush off to a table with kids since we were only a couple. 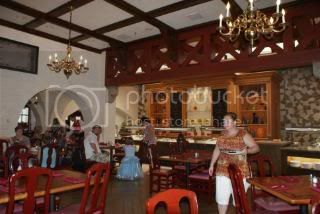 Once Princess Aurora moved on to the next table, we headed up to the buffet bar to grab a few items. My husband was extremely disappointed... there were no Mickey waffles! That’s right, no Mickey waffles. A staple item at any breakfast buffet in Walt Disney World but there were none to be found. Upon reaching our table, within minutes Snow White stopped by. Of all of the Disney Princesses, she’s my husband's favorite (maybe that’s why he married a German girl). While Snow White was at our table, the mother at the table next to us referred to her as Cinderella. Politely, with a smile and sweet voice, she turned and said “I’m Snow White.” It was funny to me because Snow White and Cinderella look nothing alike. But speaking of Cinderella... she was up next. 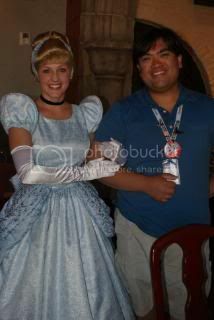 Not more than a couple of minutes went by and Cinderella was at our table. 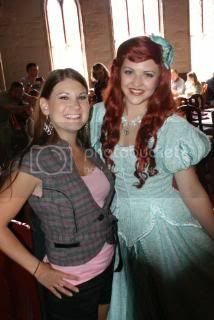 After Cinderella left, we had a little bit of time to eat a plate of food before Ariel came by. She appeared in her beautiful ballroom gown. The breakfast was Norweigian-style including some American fare. Camilla brought us the family style items which included scrambled eggs, bacon, sausage and potato casserole. If you wanted items like fresh breakfast breads, fresh seasonal fruit and yogurt, you had to visit the breakfast bar. Camilla always made sure that we had a full plate of food. Anytime we ran low on one of the family style items, she’d be by with another serving. Since the princesses had stopped by so early on, we had plenty of time to enjoy our breakfast without any interruptions. At the end of the meal we received our photo package including one Belle photo, one 6x8 photo and 4 4x6 photos in a souvenir folder. This was included as part of the breakfast package price ($30.99). Overall, I’d say that the restaurant was okay. The food came out hot and was tasty, but there wasn’t as much variety as with the other buffet breakfasts; but then again, this was a family style/buffet breakfast. Akershus is beautifully decorated, better than I remember it being back in 1996. The service is absolutely great. Like I mentioned previously, Camilla made sure that we never needed anything. The interaction with the Princesses was nice as well. They were all happy to pose with us and to autograph the cardstocks for my scrapbook. It wasn’t my favorite Disney character breakfast by any means but I’d return in future. I don’t know if my husband would agree. He was pretty disappointed with there not being any Mickey waffles. I LOVE Akershus! We have two little princesses of our own, and we LOVE the character experience there. And I *dream* about the potato casserole. Scrumptious!